First Aid for an eye injury immediately following an accident can prevent loss of sight. 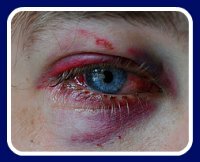 Here we've put together a quick reference guide for dealing with the most common eye injuries. 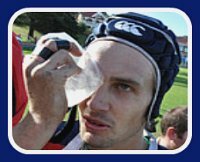 Immediately apply an ice compress to the eye to reduce pain and swelling. A black eye or blurred vision can be a sign of damage inside the eye. If the eyeball is injured seek medical help immediately. Called corneal abrasions or punctures, this is usually caused by a pencil or a stick that gets stuck in the eye. DO NOT pull the object out. Carefully cover the eye with gauze. If the object is large cover with a paper cup or similar and tape it in place. Bandage both eyes even if only one eye is injured as this will reduce eye movement. 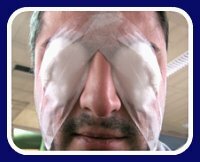 Gently cover eye with sterile gauze. Applying a cold compress can reduce pain, swelling and bleeding. DO NOT apply pressure to stop the bleeding. If blood begins to pool in the eye cover both eyes to reduce eye movement and seek medical help immediately. Lift the upper lid over the lower and allow the lower lashes to brush the grit off the inside of the upper lid. Blink a few times and let the eye move the particle out. If it remains in the eye flush the eye with water or use an eye bath. Roll the eye around as it may help move the speck out. If the speck remains, keep your eye closed and seek medical help. Flood the eye with water immediately, using your fingers to keep the eye open wide. Place the effected eye under a shower or tap, or gently pour water into the eye from a container for a minimum of fifteen minutes. Roll the eyeball as much as possible to wash out the eye. Do not bandage the eye or use an eye cup. Use antihistamine eye drops to help control itching. You can also use an individual eye wash to flush out the eye and help relieve the irritation. These eye injuries are really burns from light induced trauma to the eye. Basically sunburn on the cornea of the eye. They occur from reflected sunlight such as sun reflected off snow or water. Arc welders, tanning booths and ultraviolet lights are other possible sources. Apply over the counter artificial tears or lubricants to ease eye pain and scratchiness. Wear sunglasses if light hurts your eyes. Rest with eyes closed if at all possible. Most corneal flash burns will heal without intervention. 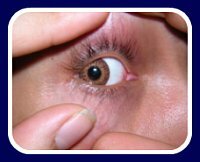 have eye pain that becomes worse or pain with the movement of your eye/s.